My wife and I were cleaning out the attic of a house we recently purchased and I came across this watch. After scouring the internet for an unreasonable amount of time I believe it is a 1932 Trident. Pretty sure it's a 1932 model based on the inscription on the back of the case. I wasn't able to find out much else about it other than what I found here on this site. Couldn't find any active or past auctions or any thing else. I think the only images I found of this model came from this site as well, and one was an image of an old advertisement. Could use a cleaning but the watch works well. Any information you can tell me about it would be welcome. I did list if for sale here, though my wife may override that decision in the end. Welcome! Watch is indeed a 1932, based on the movement marking and serial number, as well as the engraving. 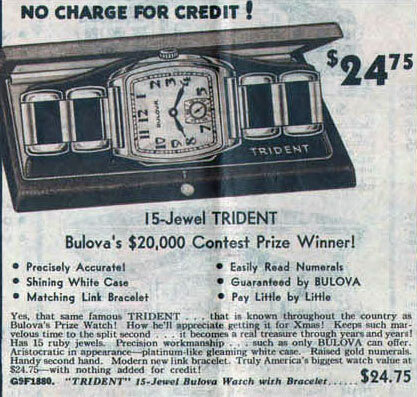 This does indeed appear to be a good match to the 1932 Trident, as referenced in 1933 dated ad below. Nice watch on the original band! It's neat that this ad is Christmas themed and Tom got it as a gift on Dec. 25, 1932!